When we were recently vacationing in South Dakota and Wyoming, Sarah and I spent a lot of time looking at rocks. We would walk along trails and stop along the roadside just to look for interesting rocks. We found a few with deep red hues and we also picked up a gorgeous piece of rose quartz. When we got home, these rocks quickly found their way into the gardens in front of our house, joining the geodes and other interesting stones that we’ve picked up over many years of walking on trails and exploring different areas. It’s a natural collection. It’s something that’s been a lot of fun for us to assemble and, best of all, it’s been completely free to assemble. 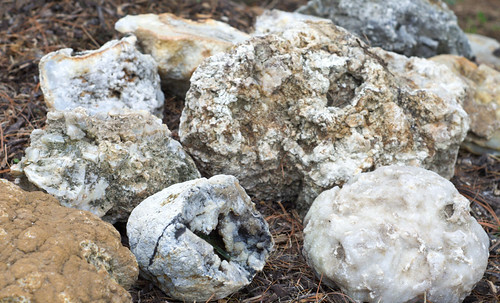 A rock collection is just one obvious example of what you can collect. There are countless opportunities for natural collections that you can take on depending on your interests: photos of birds, leaves from trees, shells, flowers, and so on. The best part? Collecting these things is free and it usually requires you to get outside and exercise, which is also free. Here are a few tactics for starting a natural collection. Pick something you find beautiful and/or have an interest in. If you’re not interested in birds, don’t strive to collect bird photographs just because it sounds novel. Look for things in nature that you find interesting or beautiful and that can easily be collected, either through actual specimens or through recording. Make sure you have a reasonable way to collect what you capture. If you’re taking digital photographs, it’s pretty easy to store them. On the other hand, if you start collecting rocks, they can begin to take up space pretty quickly. You’re going to want to have a reasonable place to store whatever you’re collecting. Always learn more. For me, a big part of a hobby like this is learning about what I’m capturing. What kind of rock did I just find? What kind of bird is that? What kind of flower is that? Where can I find some new specimen I haven’t seen before? The internet is a wonderful resource for this. I can’t tell you the hours I invested in my childhood simply learning how to identify trees. Now, Sarah and I collect rocks of all kinds with which to decorate our garden, and knowing something about each one is particularly enjoyable. Consider a natural collection. It’s basically free, gets you outside, and teaches you something new. It’s something you can do by yourself or with others. It also effectively scratches that “collection” itch that many people have.